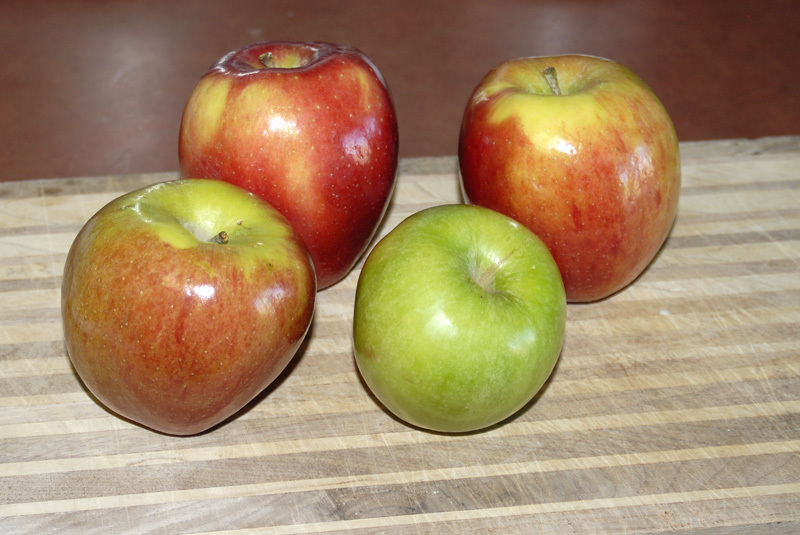 Over on Fitocracy, we're having an Iron Chef Apple challenge. This is my entry. 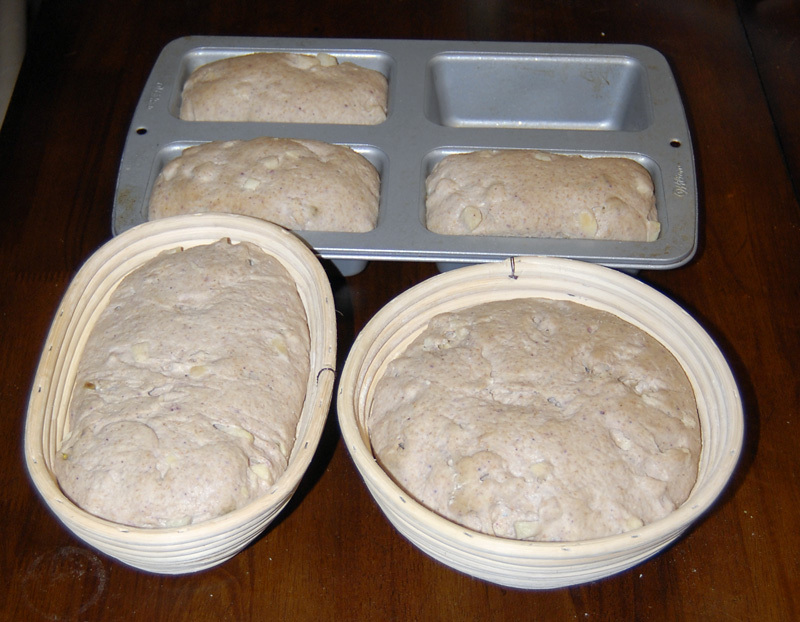 This is based on the Basic Sourdough recipe from Peter Reinhart's Bread Baker's Apprentice. 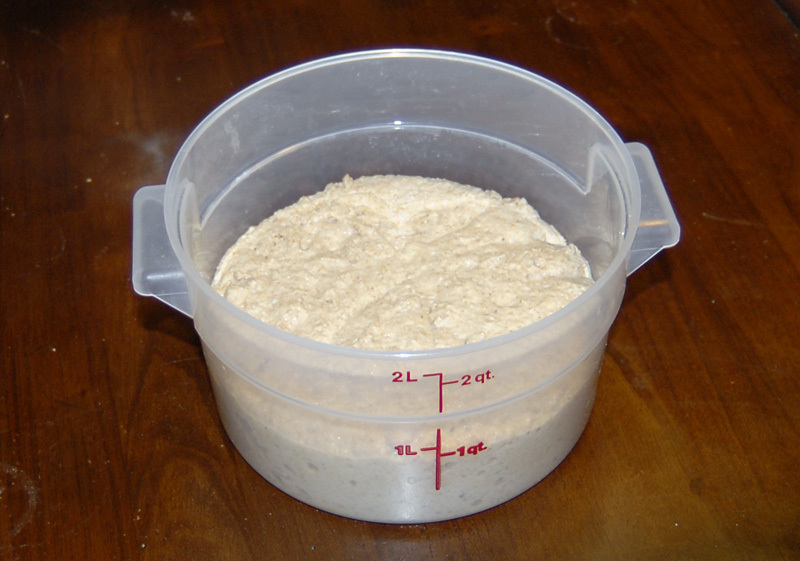 BBA also contains the instructions for making your very own sourdough starter particular to your local environment. 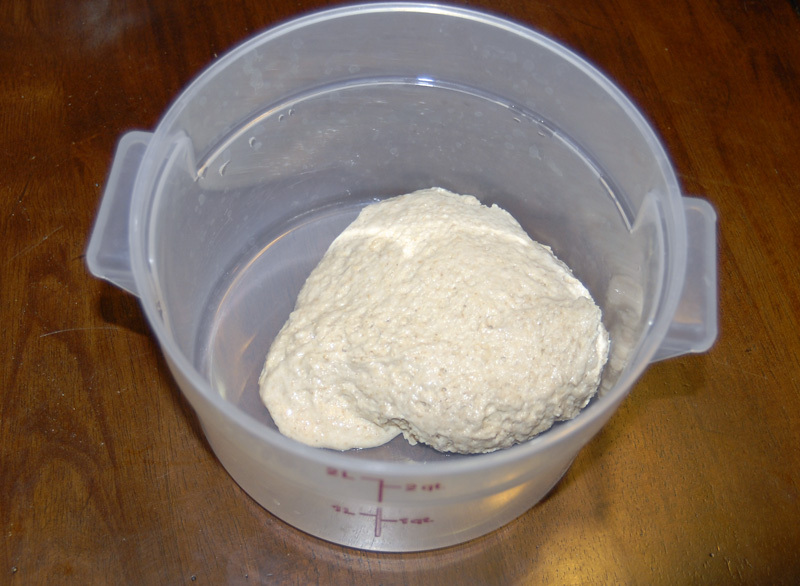 Take a few ounces of your sourdough starter, and mix in an equal weight of water and flour. Let it rise covered for 5-8 hours (it will double roughly), then put in the fridge overnight. Dice up 3-4 apples. 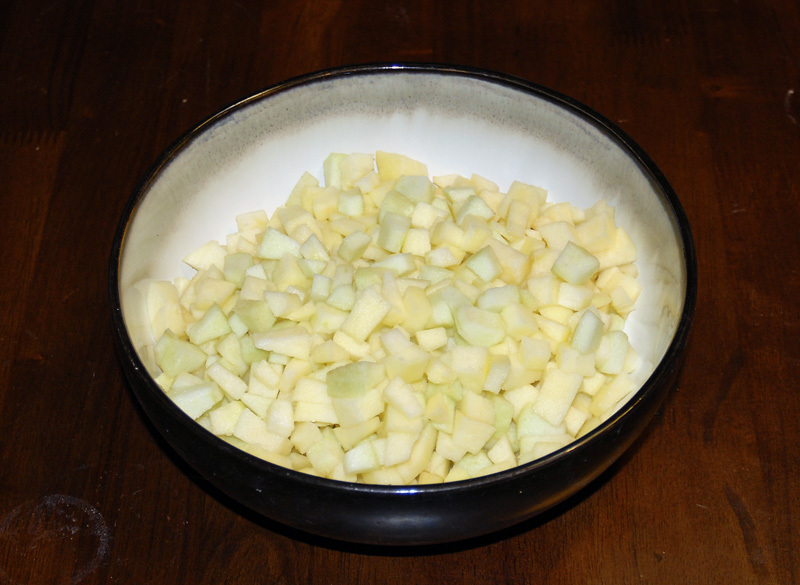 I used three Braeburns and a Granny Smith. Also weigh out 5 oz. 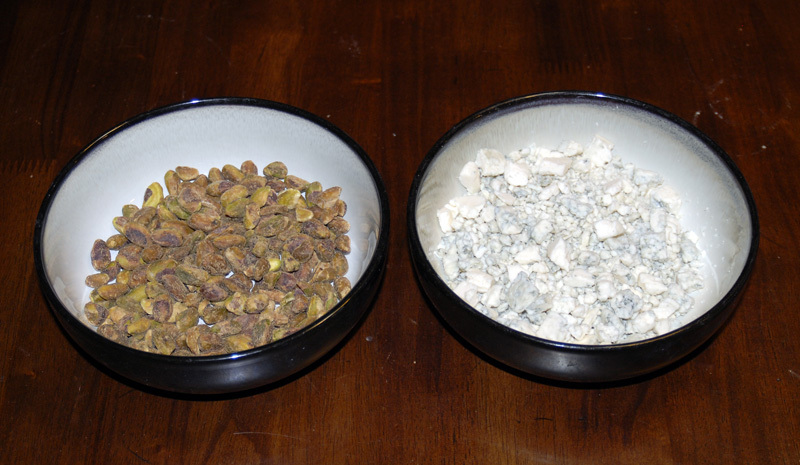 of pistachios and 4 oz of blue cheese. 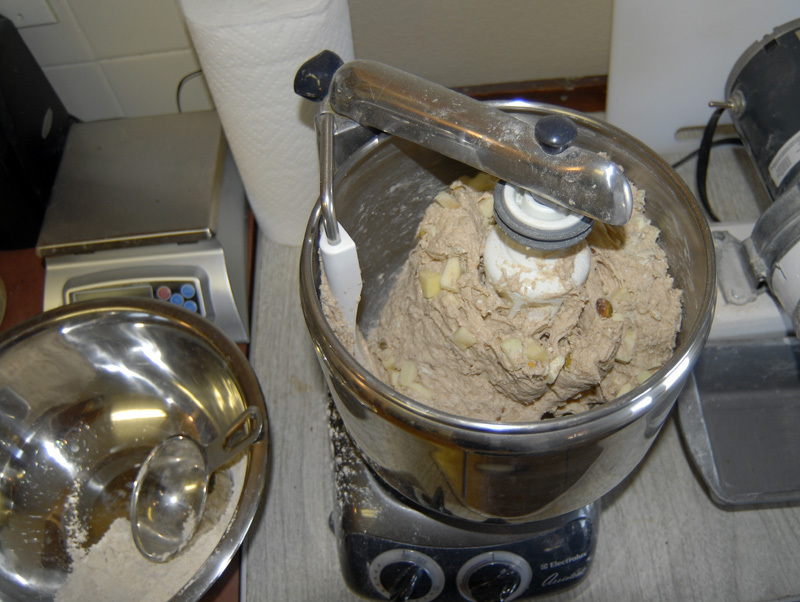 Chop the apples up last, as they'll immediately start to oxidize and turn brown. 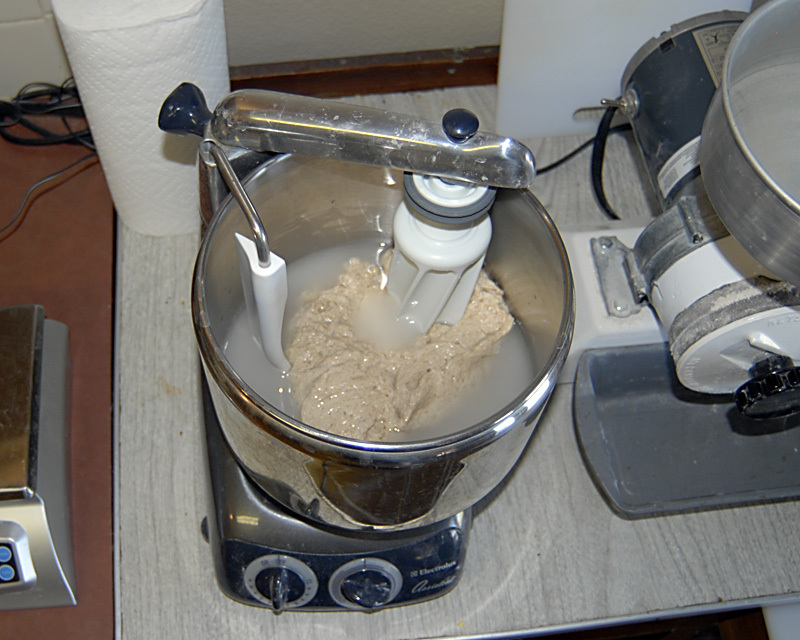 Add the water and preferment to the mixer and start it up. 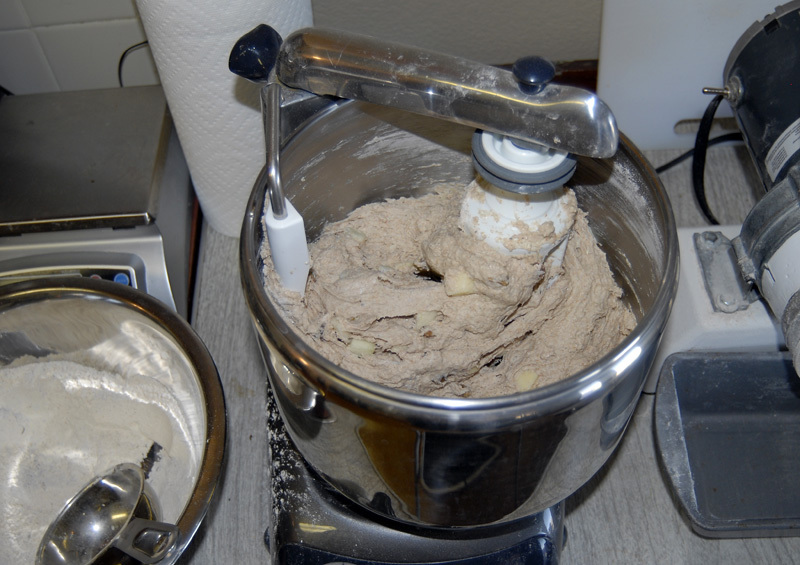 Alternate adding the apple and your flour until all the apple (and about 2/3 of the flour) has been incorporated, then alternate adding in the pistachios and the rest of the flour, adding the blue cheese at the very end. 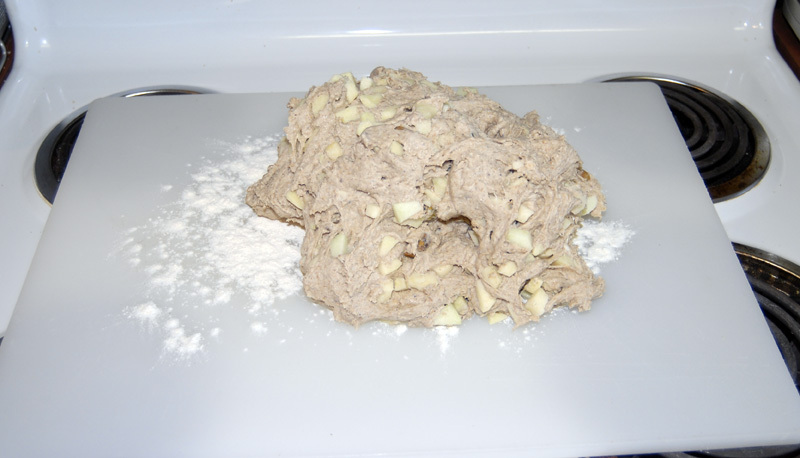 Turn the sticky mass out onto a well-floured cutting board and, using a dough blade and your hands, continue to knead and incorporate flour until it forms a fairly stiff, non-sticky dough. 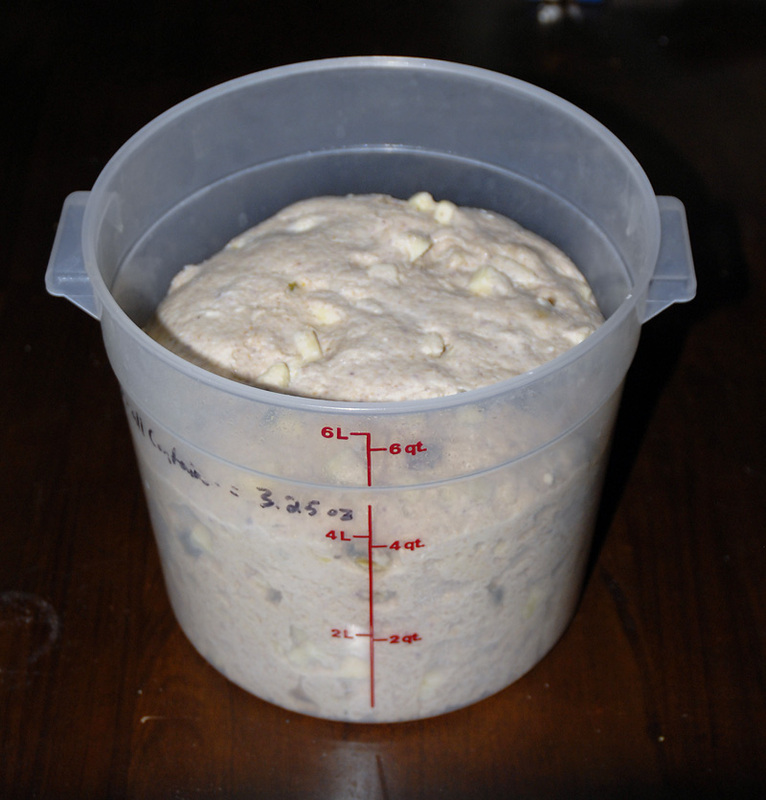 Put it in a large bowl or tub and let it rise for 4-6 hours, until nearly doubled. Refrigerate overnight. 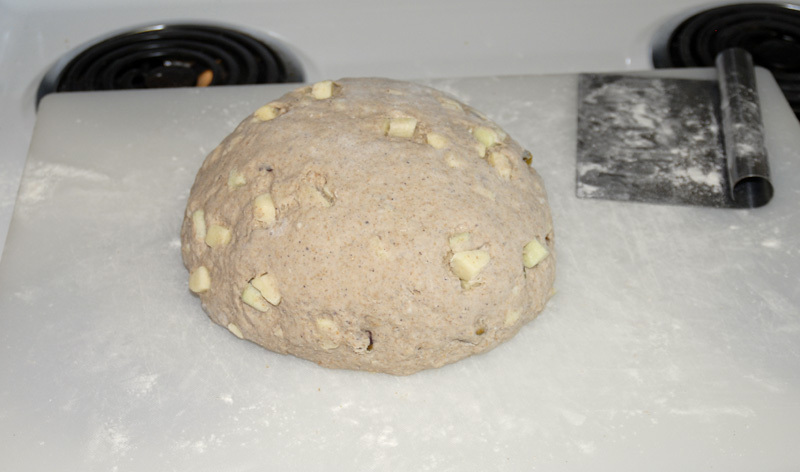 Remove the dough from the fridge at least two hours before shaping. It will have slowly risen more overnight. 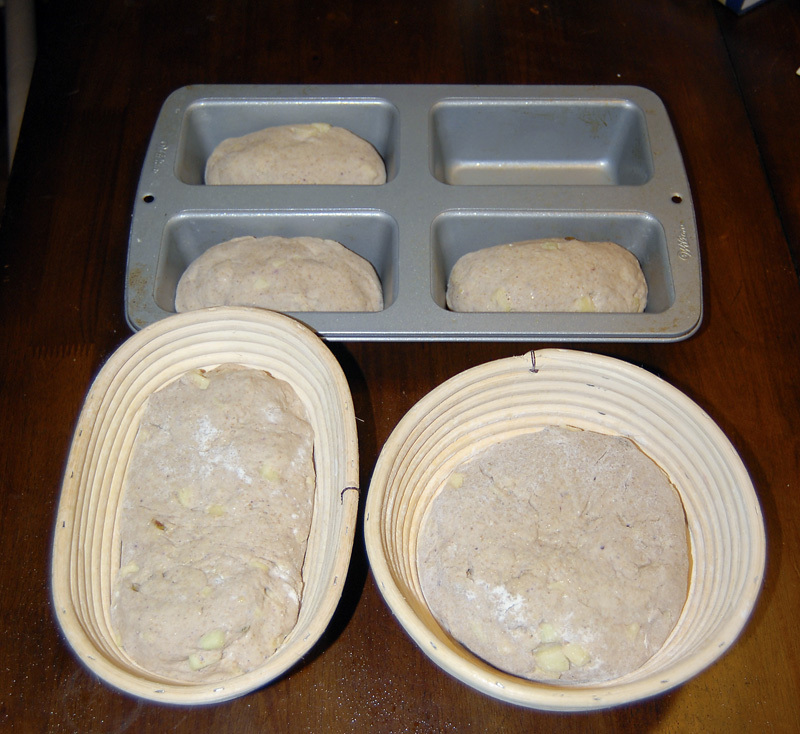 Gently divide the dough and shape it, then allow to proof covered until nearly doubled. 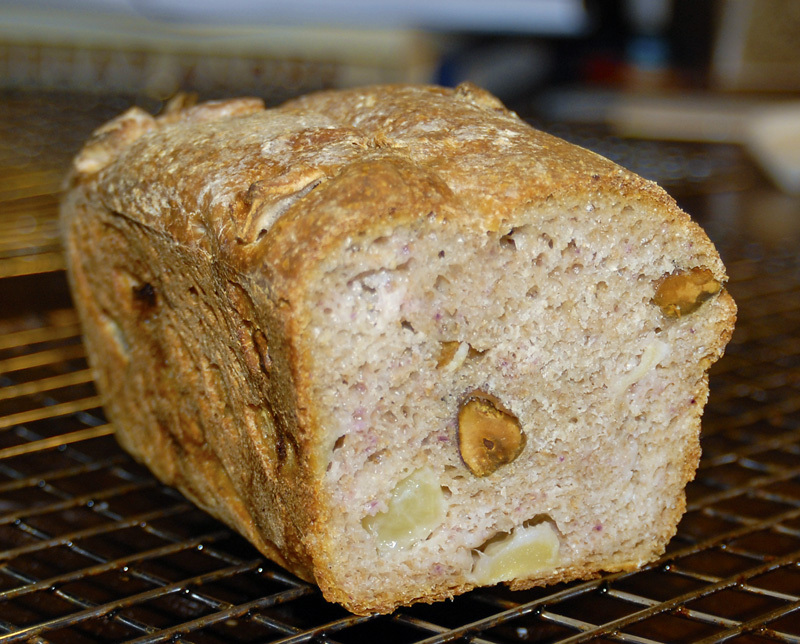 The result makes great sandwich bread -- no cheese is needed, just a couple of pieces of ham. It's also good toasted with honey for breakfast. 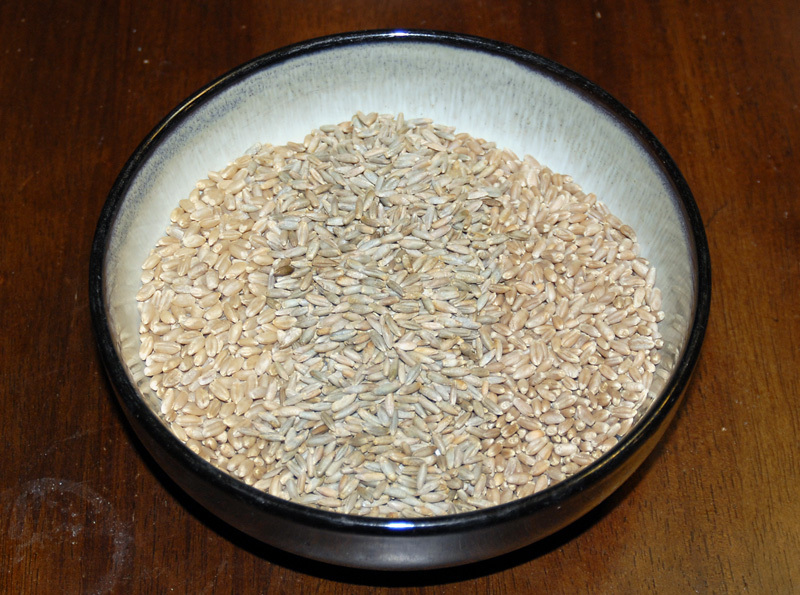 What's the (short) story on aging milled grain? You mill and bake same day, I noticed. 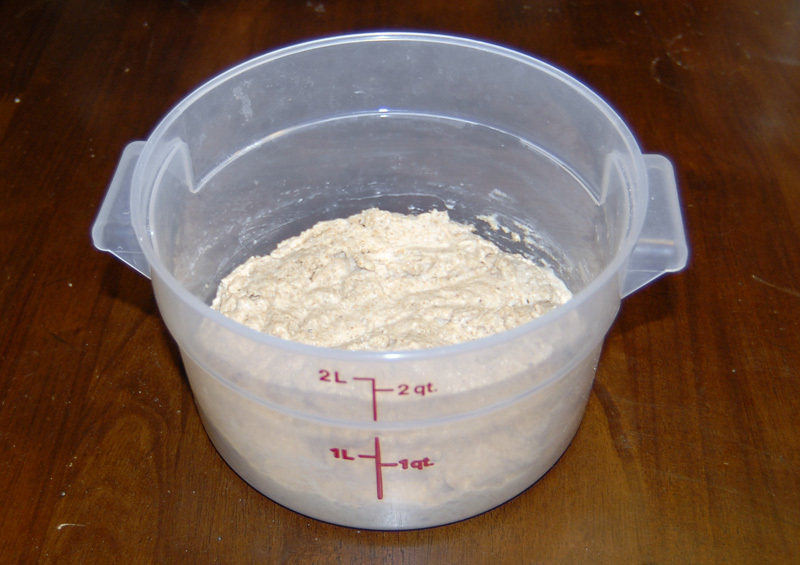 I haven't taken to home milling yet, but I have a question about it: Shouldn't milled flour rest for a few days/weeks before it's used in baking? Or is it that the wheat berries themselves need resting after harvest? Or both? Or neither? Also, any books you'd recommend on learning about home grain milling? Those loaves look wonderful, by the way. Lightly-smoked ham and (Swiss?) cheese paninis on that bread would be tasty! Oops! Missed the blue cheese. That would clash with the panini idea. 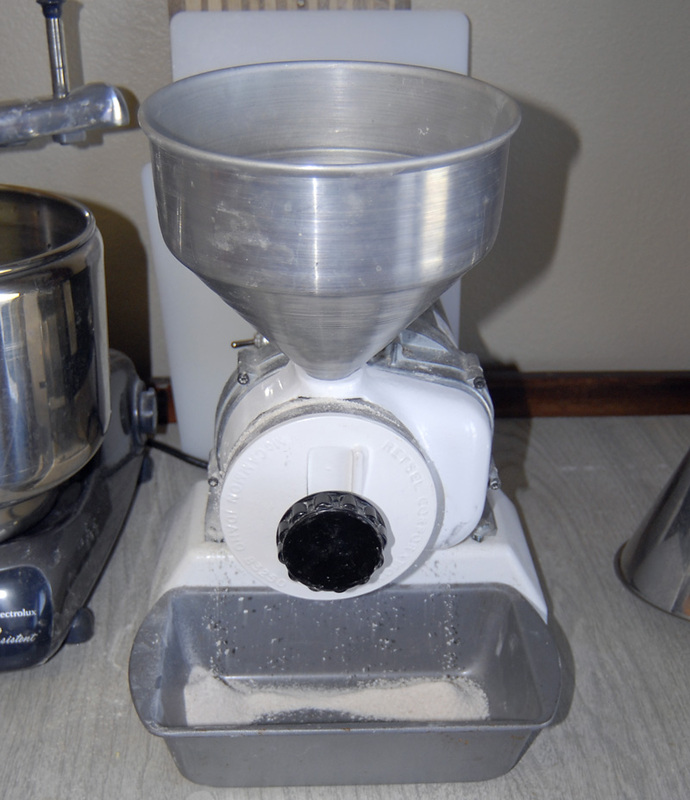 Sadly, there are no really good books about home milling that I've been able to find. There are some books that give it passing reference, but I suspect that the audience is limited. I usually grind as I need it. I don't think flour is improved by oxidation. 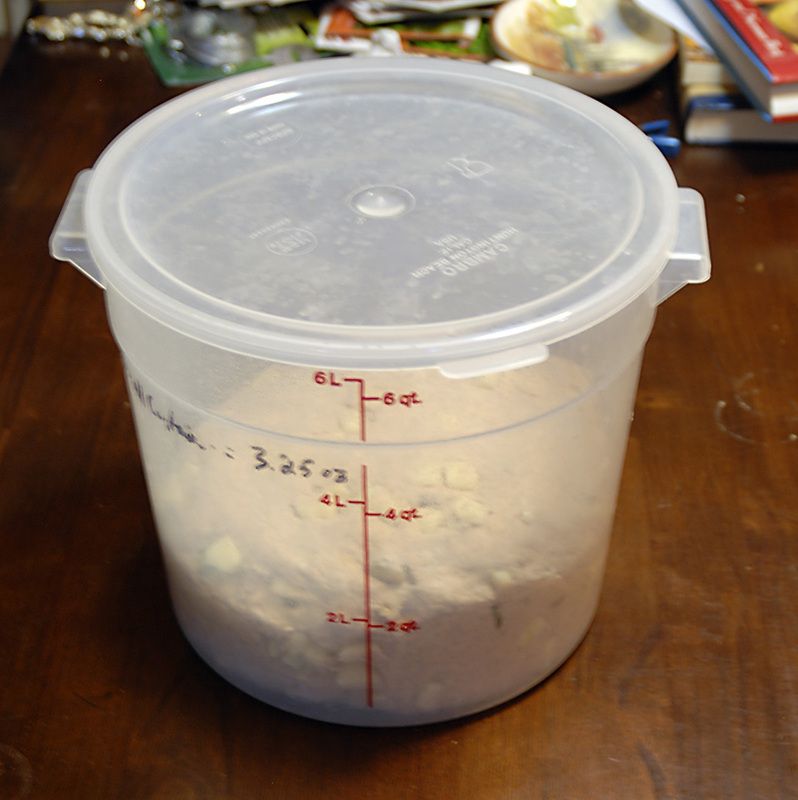 That said, if I have leftover, it keeps just fine, and many people swear by aging for a couple of weeks. I will chime in here too as I also mill my grains and I use them as soon as they come out of the mill...I want fresh. I use an electric - a KoMo and I highly recommend it if you mill grains frequently due to the ease of use and the clean up. Also allows for different coarseness of your grains. Learning: Learn as you go but there really isn't much to is. Very simple process. 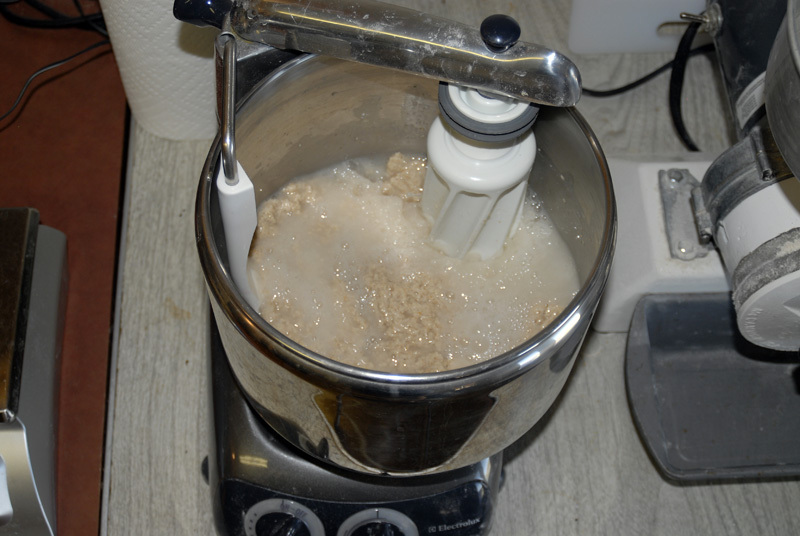 Others here who use mills are Proth5, Pips and Mango Chutney.....maybe others but I am not aware of them. If you want fresh and the entire grain - you can't beat home milling.....my opinion only. Oh, buying whole grains is a whole lot less expensive than buying flour....A 50# bag of organic wheat costs me about $36.00.....If you bake a lot the mill will pay for itself in no time. No, the Mill-Rite comes with a motor. You can order a separate kit to operate it manually. I see you use PR's first book. 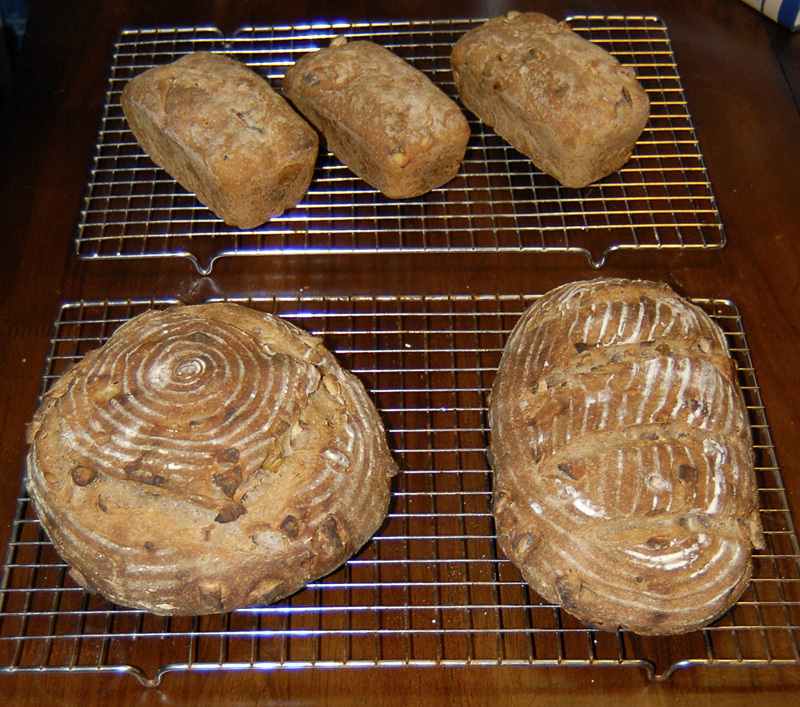 I do use his second book for some stuff -- there's a blog of his multigrain Struan a bit earlier in my entries. I've baked his BBA sourdough so many times that it's my go-to bread, and it is infinitely adaptable. 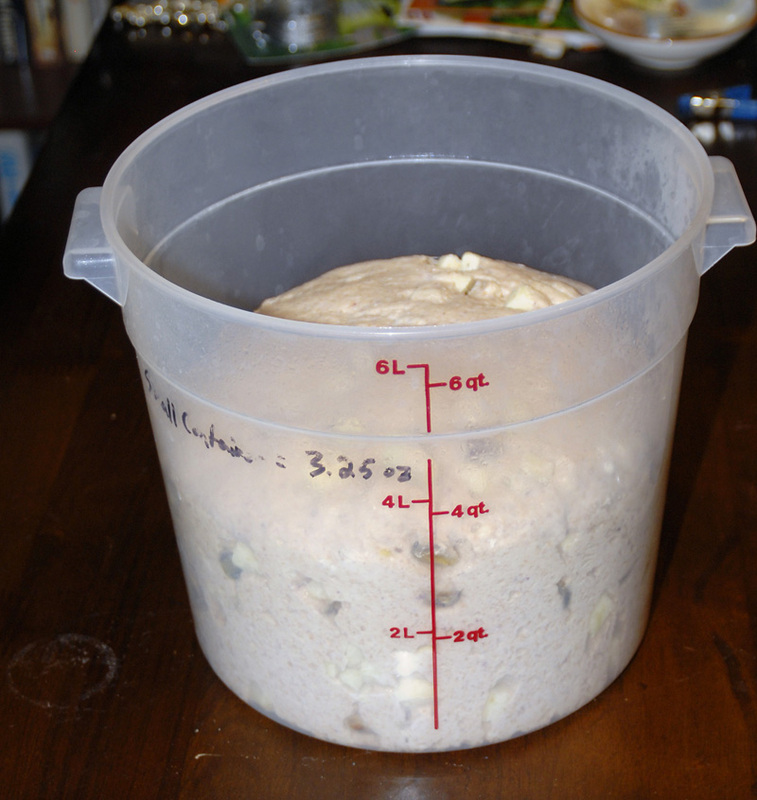 I always retard the preferment overnight, and then retard the final dough overnight, and it seems to duplicate the effect of a soaker.